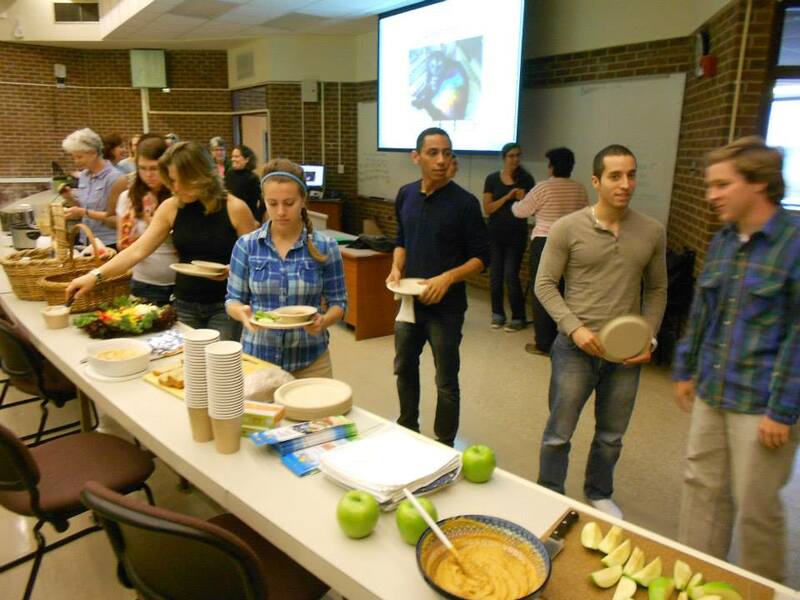 The third Chapel Hill Vegan Pledge began on November 2nd with another great group of Pledges! At our first meeting, we discussed the far reaching implications of adopting a vegan lifestyle, including animal ethics, social justice, environmental concerns, and health and nutrition before enjoying another amazing cooking demo provided by longtime volunteer Linda Rapp Nelson. In addition to tiramisu cupcakes, carrot cake, and beer bread provided by our mentors, Linda made a delicious vegan chili, a maple-mustard dressing, and a pumpkin cheesecake spread. At our following meeting Linda and Professor Alan Nelson led an in-depth discussion of vegan ethics and Justin Van Kleeck, founder of Vegan Night Out, presented on the heavy environmental impact of animal agriculture. For our cooking demo, Monika Caruso prepared delicious gluten-free feast, included her much sought after mac and vegan cheese. Registered Nurse Stephanie Hodges joined us for our third meeting to present on health and nutrition and she showed us how to prepare a tasty meal with no salt, no sugar, and no oil. Then Lenore Braford of the Piedmont Farm Animal Refuge joined us to discuss common “humane” myths and explain what terms like “cage-free” and “free-range” really mean. Finally at meeting 4 we were treated to a shopping tour of Whole Foods and some delicious vegan chili with cashew sour cream followed by a potluck to celebrate another successful Pledge. And we’re very excited to announce that sign ups are now live for our fourth Pledge in the Triangle region! If you’re interested in learning about veganism and eating some delicious vegan food, please join us in Chapel Hill this February! Veganism is better for your health, better for the environment, and the morally right thing to do. Start the new year by living your values and go vegan with us! To learn more, please visit the Peace Advocacy Network and the Triangle Vegan Pledge on Facebook and join our Meetup group!